From Bandai to Banpresto, the best toy brands came to play. The New York Toy Fair has come and gone this year. Extending from February 17-20, the show filled Jacob K. Javits Center’s exhibit space with hundreds of thousands of toys, games and youth entertainment products. 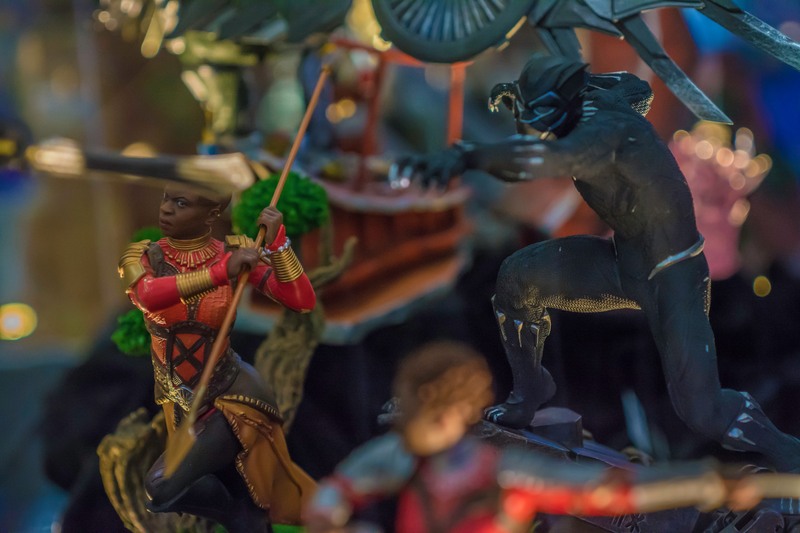 But the cream of the crop in terms of figures and collectibles caught our eyes, ranging from comic book, video game, and anime characters, all portrayed with enriched details any fan can appreciate. Based on original references from Black Panther and made in Polystone. These hand-painted pieces are available now for pre-order ranging from $100-$115 USD. NECA came to Toy Fair showing off their officially licensed 18″ Kratos figure from the upcoming God of War, now on Amazon. There is also an Ultimate version of Deadpool with two interchangeable heads slated for a Q2 release. Mezco showed off a few pieces from its One 12 Collective, which features Batman Beyond (expected for a Summer release), Green Lantern, The Joker (slated for a Fall release), and an updated Alex from A Clockwork Orange also due for the Summer. You can pre order the latter now for $80 USD. The Black Panther figure is also slated to release during the Summer for $80 USD, you can pre order now. Dark Horse turned heads at Toy Fair when a statue depicting Geralt of Rivia from The Witcher 3 taking a bath showed up on the floor. CD Projekt Red and Dark Horse are still “a little on the fence” about this statue, so there’s no release date or price. There was also a sweet Link statue from Breath of the Wild available now for $90 USD. S.H. Figuarts shows off its love for Dragon Ball with an array of iconic figures and collectibles from the franchise. Master Roshi, aka Muten Roshi, aka ‘Kamesennin’ will be released in July for $60 USD and it is now available for pre order. Shenron/Shenlong and Bulma have no additional information, unfortunately. Banpresto flexed its always gorgeous anime products, the most stunning being a statue of Goku Black in all his Super Saiyan Rosé glory, Goku going Blue, as well as Luffy from One Piece decked out in an outfit for his 20th anniversary. Find out more information for Goku Black here, and preorder the King of Artist addition of Luffy here. Outside of a terrifying Joker bust by Rick Baker for $1,000 USD that spun heads, there was a Brian Bolland designed Joker piece with a hand full of Joker cards on display. Premium hides from the heel to the toe cap. Lou Phelps & Jazz Cartier Release New Track, "Come Inside"
The Bay Area rap collective has officially arrived. No.One Drops the Bravo "Kudu Edition"
Only 24 will be available. The two gave a talk at Nike’s recent England & Nigeria kit launch.